Broadway In Chicago and the producers of ANASTASIA announced that ANASTASIA, the romantic and adventure-filled new musical inspired by beloved films, will make its Chicago debut at Broadway In Chicago's Oriental Theatre (24 W. Randolph) for a limited two-week engagement March 26 through April 7, 2019. 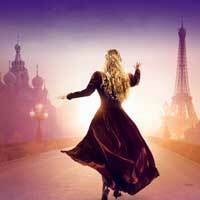 ANASTASIA will be part of Broadway In Chicago's upcoming season. Subscriptions will go on sale in the fall of 2018. ANASTASIA will join the line-up of performances at the annual Broadway In Chicago Summer Concert, sponsored by ABC 7 Chicago and hosted by Janet Davies, ABC 7 Chicago's entertainment reporter and host of the entertainment and lifestyle program 190 NORTH on ABC 7. The Broadway In Chicago Summer Concert will take place on Monday, August 13, 2018 at 6:15 p.m. at the Jay Pritzker Pavilion at Millennium Park (201 E Randolph St). This 2017 Broadway hit features book by celebrated playwright Terrence McNally, a lush new score by Stephen Flaherty (music) and Lynn Ahrens (lyrics) that features favorites "Journey to the Past" and "Once Upon a December," and direction by Tony Award winner Darko Tresnjak.